Did Vladimir Putin personally lead a successful effort to hack the DNC, collude with Wikileaks to release data obtained by such means, and thereby sway US elections? Probably not. In fact, according to Craig Murray - who actually played a part in Wikileaks' handling of DNC emails - the data in question was leaked by a party insider in order to blow the whistle on the Clinton campaign's manipulation of a blatantly corupt political machine. Murray's claims effectively call the legitimacy of the US political machine into question. So do the leaked emails themselves. So do statements like those made by former UN ambassador John Bolton - who has suggested the Russian hack story is a politically-motivated contrivance amounting to a 'false-flag attack'. But questioning the the US political machine's legitimacy is taboo, so pertinent facts like these are being thoroughly buried under a giant pile of anti-Russian propaganda. Even in the absence of actual legitimacy, the perception of legitimacy must be maintained by the powers that be. "The managers of the military, intelligence, and law enforcement departments of our government are largely self-governing, virtually immune from democratic accountability and the checks and balances described in civics books. They make up a second government: The one we elect provides public frontage, but the concealed, unelected one actually defines and manages the nation’s security. ... If the curtain were pulled back and the security managers were revealed to exercise extravagant power, presidential credibility would collapse. And so would that of the managers: With no electoral connection, their legitimacy derives from that of the president. Were a president to appear as presider rather than decider, compliance with presidential directives would be undermined. Legitimacy, in a system of double government, depends upon mutual cooperation to mask the two layers. So no matter their differences, our elected officials and our sprawling national security apparatus will unite to defend the total system's legitimacy - however illusory this may be - because their power is ultimately derived from the willingness of average people to buy the version of reality that they are selling. But this version of reality is an increasingly hard sell in our fragmenting society. The attempts to peddle it now taking place via mainstream media and government mouthpieces further blur the line between real and hogwash in our thinking. And as the 'open source insurgency' introduced in my last post gathers momentum, it threatens to erase this line entirely. 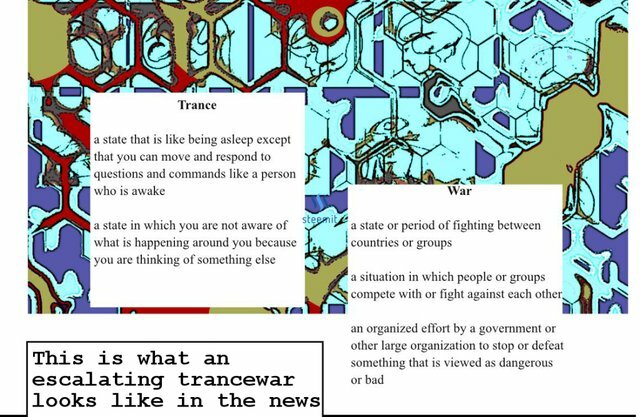 If you would like to learn more about the trancewar, or if you are interested in contributing to the development of practical solutions to the problems that it causes and is likely to cause in the future, stay tuned. I will continue posting on this topic regularly. Ugh Mada, why are you spewing this fake news when there's a perfectly good rumor out there to get crazy about??? Seriously though, I feel like there are only a few people I know (you included) that actually cared to examine these claims. The end game is here if we can so easily rabble the peasants with cries of Russia's taking over!!!! People don't even care what's in the emails, just that they were leaked (NOT hacked). What kind of twisted, hybrid dystopian world is this that Aldous and George are more "real news" than most outlets approved to run Merica's message. I would just repeat the rumor like an obedient peasant IF the rumor was a bit more interesting.